Zucchini Lasagna Roll Ups are a healthy and low-carb alternative to the traditional lasagna noodles. This gluten-free dish is rich and flavorful and is guaranteed to win you over. The party bites zucchini rolls can be made ahead of time, and are perfect to feed a larger crowd. 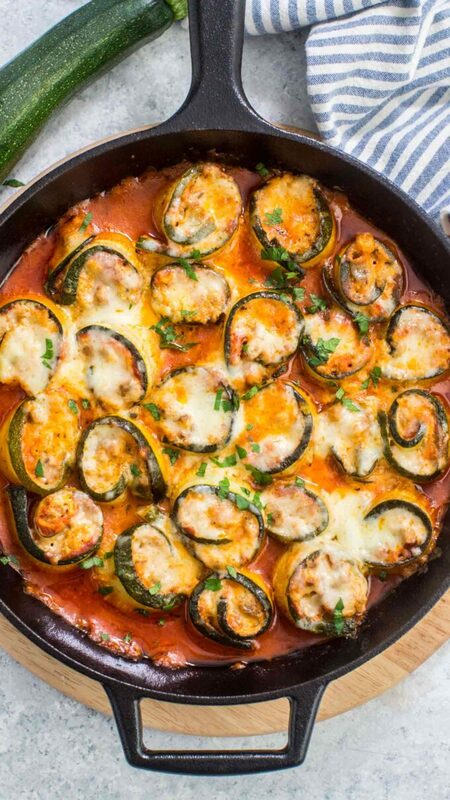 Zucchini dishes are becoming more and more popular on our blog. We enjoy cooking zucchini inspired dishes as they are nutritious and very tasty. You can also try our Chicken Bacon Ranch Zucchini Boats or Zucchini Lasagna. If you want to indulge yourself with a zucchini inspired dessert, this Chocolate Zucchini Bread is an amazing option. Zucchini Lasagna Roll Ups is easy to make and it is stuffed with ricotta, parmesan and baked in the most delicious marinara sauce. This dish is very tasty and has a nice and festive look to it. If you want to impress your guests with something healthy, yet delicious, this is the meal to cook! With everything this dish has to offer, we really doubt you will ever miss the lasagna noodles. Plus, it’s so much healthier, lighter, and also keto friendly! You can use this dish as an appetizer, main course, or side dish. Zucchini is the perfect replacement for pasta because it is soft and very easy to cook. Also, you can easily shape the zucchini in the forms you want, so it is an excellent veggie for many recipes. Being so healthy and low in carbs, zucchini has become our go-to veggie lately. Even our 5-year-old son loves this recipe and asks to pack the zucchini roll-ups for lunch every time we cook them. It also freezes well, and leftovers are just as delicious. How do you slice zucchini for Lasagna Roll-Ups? We recommend cutting the zucchini lengthwise to about 1/8 inch slices. You can try cutting them by hand, but the best bet would be using a mandoline. This way all the roll-ups will have the same size and a festive look. Also, cutting them into 1/8 inch size allows the zucchini to roll up with easy and not to break up. WHAT’S THE BEST ZUCCHINI FOR Lasagna Roll Ups? When making roll-ups, it is important to have a uniform and larger size zucchini. Look for medium-large to larger size zucchini that weighs just under a pound. How to prevent soggy zucchini? Sprinkle with salt – once sliced, sprinkle the zucchini with some salt and let sit for about 15 minutes. Then, pat dry the zucchini with a paper towel before rolling up. Refrigerate – do the above steps, but also refrigerate the zucchini roll-ups overnight once rolled up, but before cooking. After sitting for a few hours in the fridge, the zucchini will release a lot of moisture, which you can easily drain before cooking. Bake or grill – other option would be to bake or grill the sliced zucchini for about 10-15 minutes. Just enough to remove the moisture. 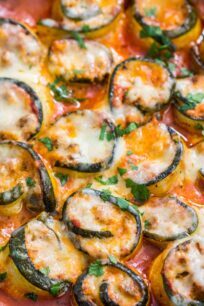 Once sliced, transfer the zucchini into a hot oven (350 degrees F) for about 10-15 minutes, so they soften just enough to become pliable. Make sure not to overcook the slices in the oven, or they will become too soft and fall apart while rolling. Important to note – when rolling the zucchini slices, try not to apply too much force. In other words, use a light touch, and don’t worry too much about making the perfect rolls. Once you arrange them together in the skillet, they tend to fall into line perfectly. Can you freeze Zucchini Lasagna Roll Ups? Yes! Simply transfer the roll ups into an airtight or a freezer proof container. Freeze up to 3 months. When ready to serve, transfer the dish into a baking pan, and bake it in the oven at 350 degrees F for about 10-15 minutes. You can use summer squash instead of zucchini. They have a similar texture but taste a bit sweeter. Similarly, you could make this dish with eggplant. For a spicier kick, add some crushed red pepper flakes into the ground beef mixture. You can swap the meats. We used ground beef for this recipe. However, ground turkey, chicken, or even pork will work just as fine. For a vegetarian version, skip the meat. Also, if the marinara sauce is not up to your liking, swap it with vodka sauce or arrabbiata sauce. Zucchini Lasagna Roll Ups are healthy and low-carb alternative to the traditional lasagna noodles. This gluten-free dish is rich and flavorful, and is guaranteed to win you over. Cover the bottom of a large rimmed baking sheet with parchment paper and lightly sprinkle with olive oil. Set aside. Slice the zucchini in 1/8 inch slices and arrange them in one layer on the prepared baking sheet. Sprinkle with salt and pepper and bake for 10-12 minutes, until softened. Place the cooked zucchini slices on paper towels to remove extra water. Add the diced bell pepper, diced tomatoes, and paprika. Stir well and simmer on low for about 20 minutes. Taste and adjust for salt if needed. Add beef mixture to a large bowl and add ricotta cheese, parmesan cheese, 1 cup of mozzarella cheese and the egg. Stir until fully combined. Lightly grease with olive oil a 10 inch cast iron pan. Add 1 cup of marinara sauce to the bottom. 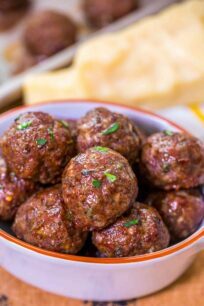 One by one, spread a little marinara sauce onto each one, and spread one tablespoon of the beef mixture onto it. Roll and add the zucchini roll-up to the prepared pan. Repeat with the remaining zucchini slices. Top with the remaining cup of shredded mozzarella cheese. Cover with foil and bake for 30 minutes until cheese is melted and zucchini is cooked through. Remove foil during last 5 minutes of cooking. Oh my gosh those look awesome! I have been watching what I am eating and this is defiantly one thing I can eat without guilt! YUM! This looks like the perfect meal for my family. 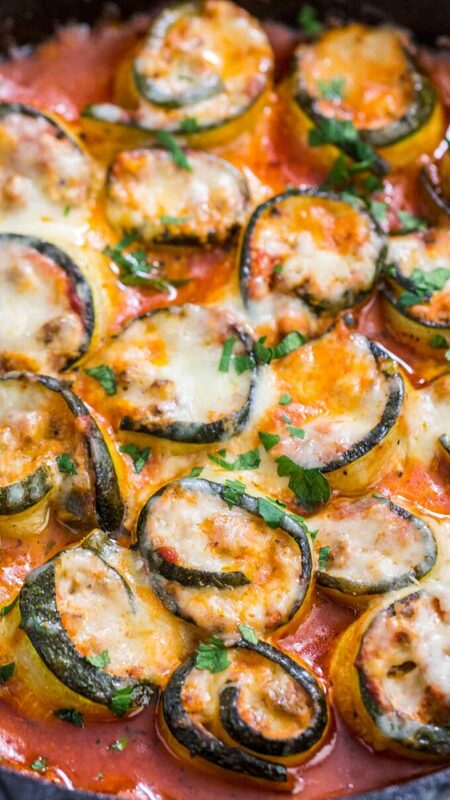 We all love zucchini and lasagna so replacing the noodles will fit right into our way of eating. So yummy looking! We make this dish but we don’t do the roll ups. We just layer the zucchini strips in the pan. All turns out delicious. This looks interesting although I don’t eat beef for humane and health reasons. It would bGisele e just as good fixed vegetarian. My husband isn’t big on zucchini, but I am! I would definitely like this and would like to make it. These look so good! I don’t think I’ve ever tried zucchini lasagna roll ups before. I really should. I like regular lasagna, and I tend to love things with cheese! These sound so good. I have been craving something like lasagna lately. These look like a yummy lasagna option to try out. Lasagna is one of my favorite meals to have, so these will be much enjoyed. We recently started substituting pasta for zucchini. I’m going to have to make these for us next week! To be honest Lasagna is one of my comfort food and with this recipe you’ve given a great idea to add a twist on it. This looks really delicious and I can’t wait to make this recipe at home. This looks like the perfect comfort food dish for winter. I like zucchini but I think I would prefer to make this dish with summer squash, instead. These look amazing. I’m glad they’re made with zucchini too. I would have never thought to make these before. I’m looking forward to trying out this recipe. Zucchini is one of my favorite vegetables especially as the temperatures start cooling down. Making them in this zucchini lasagna roll up is a new idea for me. I look forward to trying this recipe. 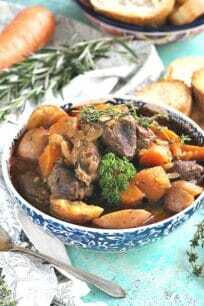 I think this recipe will be a big hit with my family! Thanks for the tips for working with zucchini. I tried making something similar in the past, and it was a wet mess. Now I know why! I plan to grow zucchini this year in my garden. It is so inexpensive to grow and you can make so much with it. That looks absolutely delicious! I love zucchini and I love lasagna too so this is perfect. I will prepare this soon! Now this looks both super yummy and super healthy! I need to try this! OMG, this looks so good! My daughter just discovered that she loves zucchini. So, this would be perfect for her! Thanks for the recipe!